Image caption Carol Babbage: "If I don't find employment I don't know what is going to happen to me"
A New Zealand woman who has lived in the UK since 1967 fears for her future after being refused work because of her migrant status. Carol Babbage, 62, who arrived in the UK aged 12 with her New Zealand mother and British stepfather, has indefinite leave to remain in the UK. 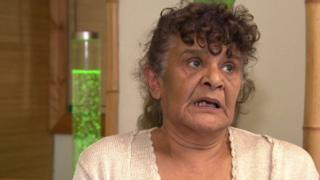 She served in the British Army, but says she was refused a cleaning job. The Home Office said it was "considering" options available to her and she had not been asked to leave. Image caption Carole Babbage's NZ passport states she has "leave to enter the United Kingdom for an indefinite period"
Ms Babbage, who raised three children in the UK, served in the Army in Northern Ireland in the 1970s and married a British serviceman, who she later divorced. She also worked in a number of care industry jobs. Ms Babbage first realised something was wrong in 2016 when she applied for a cleaning job in Plymouth and was told by the firm she could not get the work because of her migrant status. She said she had also been told that she will not get a state pension and now she fears NHS treatment may be withdrawn. She said that she had never applied for a British passport because her NZ passport states that she has "indefinite leave" to remain in the UK. "It's impacted me to the core," said Ms Babbage from Liskeard. "If I don't find employment I don't know what is going to happen to me." Satbir Singh from the Joint Council for the Welfare of Immigrants, which campaigns for justice in immigration, said a "hostile environment" for immigrants had made things harder for many people who had arrived in the UK as children. He added ordinary people "who have every right to be here, who have entered legally" can end up in a similar situation.